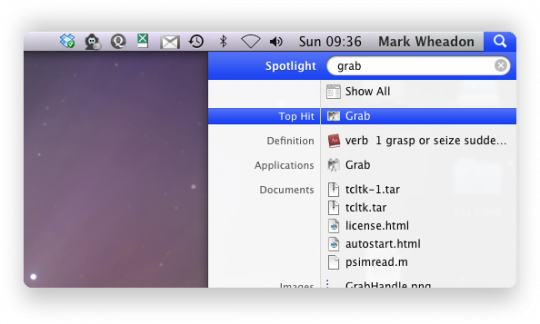 How do you dump the screen in Mac OS X when you can’t reach for a hot-key-chord? The answer is grab. cmd+shift+4 to select an area of the screen (then press space for a whole window). However, there are times when the above won’t do. Typically, it’s when you’re already pressing keys to get the image you need — the key chord cmd+shift+4 isn’t going to work if you’re already holding down alt for example. That’s where grab comes in — it’s what Mac users used before cmd+shift+3/4 came along, it’s still there, and it can dump the screen after a ten second delay. You then have ten seconds to set up the screen as needed, and grab does the rest. Then select File->Save As… to save the resulting tiff file, and you’re done. Actually, those key commands for taking screen shots go way back to the original Mac OS in the 1980s.